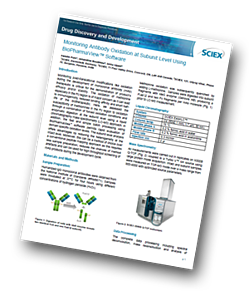 Monitoring post-translational modifications such as oxidation during the development of monoclonal antibody (mAb) therapeutic is critical for the demonstration of a product’s efficacy and/or stability. Subunit level analysis by LC-MS offers advantages by reducing the heterogeneity at the intact level. Moreover, this can be a method of choice over a conventional peptide mapping approach as this requires less sample preparation, reduces the chances of method artifacts and can be used for high-throughput screening of mAb products during the development cycle. Sample Preparation: Humanized IgG monoclonal antibodies were obtained from the National Institute of Standards (#RM8671). Samples were incubated at 37 °C for four hours using different concentrations of hydrogen peroxide (H2O2). Mass Spectrometry: All measurements were carried out in replicates on X500B Q-TOF coupled to a Turbo V™ ion source using large protein mode acquisition. Intact and subunit samples were measured on TOF-MS mode over a mass range from 900-4000 with optimized source parameters. Data Processing: The complete data processing including spectral deconvolution, mass reconstruction and analysis of oxidation levels was performed using BioPharmaView™ software. The susceptibility of mAbs to undergo chemical modifications during manufacturing, formulation and storage is one of the biggest challenge faced by the biopharmaceutical industry. This generates the necessity of having robust high-throughput workflows to monitor the stability of these biotherapeutics. The subunit mass analysis workflow demonstrated here provides a fast method of methionine oxidation determination with fast sample preparation as well as a short run time and quick processing time, especially suitable for the high throughput analysis of a large number of samples. The high-quality data obtained by the X500B Q-TOF System combined with fast data processing using BioPharmaView™ software were demonstrated to be reliable tools for the automated calculation of percent modifications under stress conditions, thereby facilitating the monitoring of critical quality attributes at the subunit level during the development of biotherapeutics.